↑ 1.0 1.1 1.2 1.3 1.4 Jackson, R., Mallon, D., McCarthy, T., Chundaway, R. A. & Habib, B. (2008). ↑ 2.0 2.1 Wozencraft, W.C. (2005). ↑ "Who We Are Global Snow Leopard & Ecosystem Protection Program". 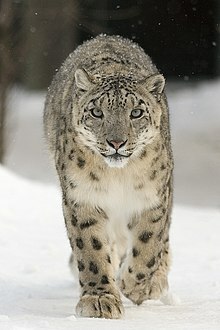 www.globalsnowleopard.org. ↑ McCarthy, T. M.; Chapron, G. (eds.) (2003). ↑ Janecka, J. E.; Jackson, R.; Zhang, Y.; Diqiang Li, Munkhtsog; Buckley-Beason, V.; Murphy, W. J. (2008). ↑ "National Symbols and Things of Pakistan". ↑ UNESCO World Heritage Centre Nanda Devi and Valley of Flowers National Parks. ↑ "Qomolangma National Nature Preserve". ↑ Jackson, Rodney People-Wildlife Conflict Management in the Qomolangma Nature Preserve, Tibet, pp. 40–46 in Tibet’s Biodiversity: Conservation and Management. ↑ UNESCO World Heritage Center. ↑ Ming, Ma; Snow Leopard Network (2005). ਹਵਾਲੇ ਵਿੱਚ ਗਲਤੀ:<ref> tag with name "carnivoreconservation1" defined in <references> is not used in prior text.